The story of Ferdinand the Bull has roots in 1936, when an old timey writer of children’s books, Munro Leaf (who also wrote “Mr. Popper’s Penguins”), chronicled the scenario of a physically-strong-yet-gentle bull, who would rather sniff flowers than fight in the bullring. Three screenwriters – usually a red flag – adapted the story for modern kid audiences, yet maintained the gentleness and humor associated with it (the film is produced by Blue Sky Animation, the creators of the Ice Age series). Strong voice characterizations also make it work, including ex-WWE wrestler John Cena as the title character. The antics in the film were a reminder of the old Warner Bros. short cartoons, with sight gags, voice asides and a nice atmosphere of fun and laughs. 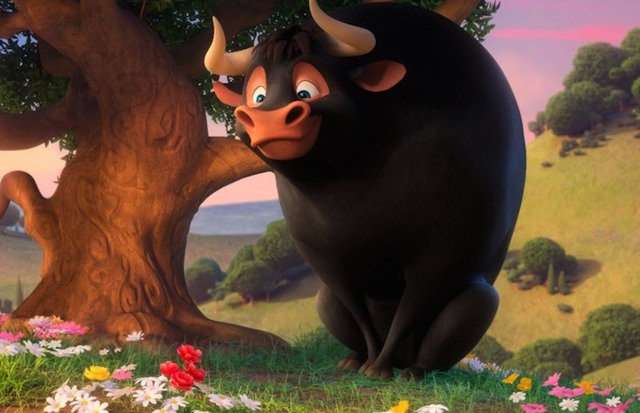 Ferdinand (voice of Cena) is a calf that is being raised in a ranch especially made for bull fighting animals. But Ferd doesn’t like to train for fighting, he likes to “stop and smell the roses.” His Dad (Jeremy Sisto) is a proud fighter, but after a ring match doesn’t come home. This has Ferdinand running away, where he ends up in a style of his nirvana, a florist farm. He grows into the largest and strongest bull, but maintains his gentle nature. He gets too big for his new owners to take him to the town’s flower festival, but shows up anyway and eventually causes havoc. This gets him taken back to the bull training ranch, where he paired with a “calming goat” named Lupe (Kate McKinnon) and a band of fellow fighters who don’t understand him. John Cena, the ex-pro wrestler, must have the same gentle nature in his steroid soul, for his vocalization of Ferdinand is surprisingly right on. It was a shock even to find out that Cena was the voice, since he’s not exactly a marquee name to put on the poster. 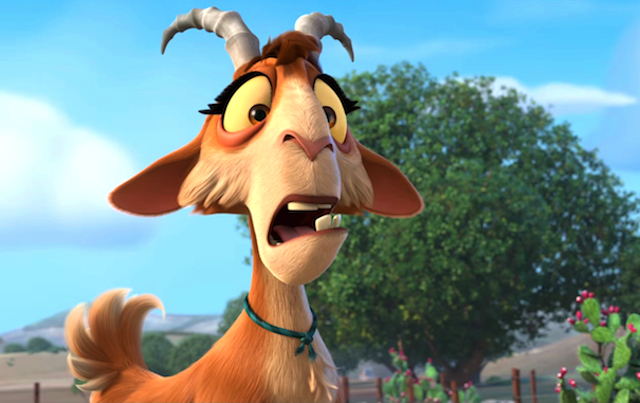 Luckily Kate “I Was Born a Cartoon” McKinnon was there to voice a goat, because there has never been scenery that she couldn’t chew. She is funny comic relief, and for once the script didn’t let her overdo it. The long history of the story also adds a bit of background chutzpah, and even Uncle Walt Disney had produced a cartoon short of the book in its era. For this film version, it was readapted to our era of short attention span, but the gang of adapters never fell away from the essence of the gentle Ferdinand. The goofiness that was inherent in all the silly characters gave the whole story the feel of a Warner Bros. (Bugs Bunny) short. It’s impossible for me to assess the appropriateness for kids of the ever expanding animated film landscape – beyond intentionally adult-oriented flicks like “Loving Vincent.” What does the modern child really like, entertainment-wise, in this era of instantaneous screen availability? Their generation of parents still know the movie theatre, but when they get to the breeder age, will they care to take their kids someplace else to see an animated film (which takes an army to produce), or simply wait until it’s downloaded to the chip in their brain? These are questions for another day. In the meantime, here is the cartoon with a gentle bull, voiced by an ex-practitioner of fake sports. How symbolically suitable for the end of this particular year, as we try to access our gentleness to survive.